An annual memorial service to commemorate those who lost their lives in an M62 coach bombing will take place on Sunday. An IRA bomb exploded on the coach carrying off-duty Army personnel between junction 26 and 27 near Oakwell Hall on February 4,1974. 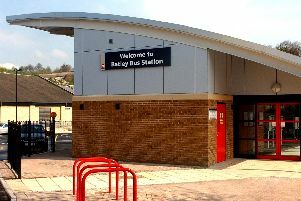 The entrance hall of the westbound section of the Hartshead Moor services area was then used as an impromptu first aid area for those wounded in the blast. Nine were soldiers and three were civilians. The coach had been commissioned to carry Army and RAF personnel on leave with their families from and to the bases at Catterick and Darlington during a period of railway strike action. Sunday’s commemoration will take place at the westbound section of Harsthead Moor services which is between junction 25 and 26. People will gather from 10.15am. The service is thought to last until around 11am. The mayors of Calderdale and Kirklees will attend alongside the Mayor of Oldham – which is where many of the victims were from.Around 200 people, including victims’ families and those who helped the injured on the day, will attend. Terry Brewiss, chaplain for the Spenborough branch of the Royal British Legion, will lead the service. The Mayor of Kirklees, Coun Paul Kane, is due to decribe the events of what happened on the day. Family members of the victims will read out the roll of honour. The Last Post will be played and a parade of banners will be on show.